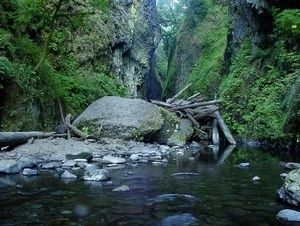 This popular adventure up Oneonta Gorge is extremely unique. You can visit Oneonta Gorge any time of year, but you dare only hike up it when the water is very low, because UNLIKE ANY OTHER HIKE ON THIS WEBSITE, you must actually walk up the river, there is no trail.... the river is the trail. Be aware that the route up this canyon changes continually, and there may be times when the log-jam near the beginning of the Oneonta canyon is just too difficult to negotiate. To be safe, you may need to turn back not try and crawl over the logs. You park in the designated areas near the Oneonta Bridge, and walk down to the water on the east side of the bridge. After that, you're on your own. Seems precarious, but it shouldn't be.... thousands do it every year.... and they all survive. Almost immediately you will come to a large log jam stuck in the canyon. Be VERY CAREFUL when crossing this, especially if any of it is wet, because it can be very slippery. After you get across the log jam, now you just walk up the creek.... I mean wade.... in other words.... YOU GET WET. This is a very short hike, but very soon you are up to your you know what is water. Yes, it gets deep, and for children, they may not be the ticket, especially for small children. The water at its lowest is probably about 3 feet deep, so we aren't talking over anyone's head.... unless anyone is very short. Anyway, after wading this pond, you come to the end, and the reward that makes it all worth it.... the falls. After you've taken all the film that's left in your camera, you now have to repeat this process by wading back out of this hole.... oops, I mean gorge. On a hot summer's day, hiking doesn't get much better than this. When you finally get back to your vehicle, and you get dried off and you get dry shoes on your feet, if you'd like, you might want to go for another short hike and see the top of that canyon you just waddled up. In recent years a nonprofit group has put together the funds to unearth the Oneonta Tunnel and make appropriate repairs so that it is close to the original look and safe to walk through. 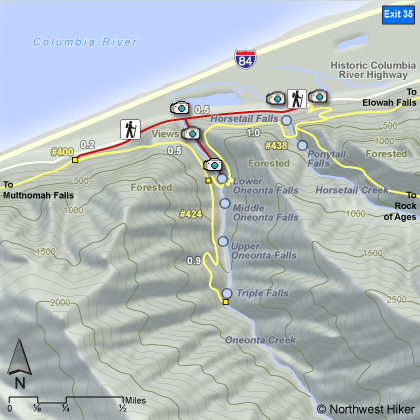 From I-84, take Exit #35/Ainsworth and head west on the Historic Columbia River Highway for approximately 2 miles. Just east of the Oneonta Tunnel on your left/south is the Oneonta Gorge. Parking is limited.